With an aim to better children's lives by teaching them useful skills—both mechanical and social—Open Roads provides a variety of after-school programs. Through simply building bikes, these students are taking steps towards a successful future. Like most nonprofits, Open Roads began with the desire to do something good. But unlike most nonprofits, Open Roads also began with a collection of bicycles filling every square inch of its founder's garage, just begging to be useful part of someone's life. With an aim to better kids' lives by teaching them useful skills—both mechanical and social—Open Roads provides a variety of after-school programs. Through simply building a bike, kids take the first step in a successful future. In 2008, founder Ethan Alexander, a cyclist and bike repair enthusiast, decided to put his collection to good use. As told on his website, "Eventually, I learned that I had a problem. Bikes were filling my basement and corners of my home," he said. 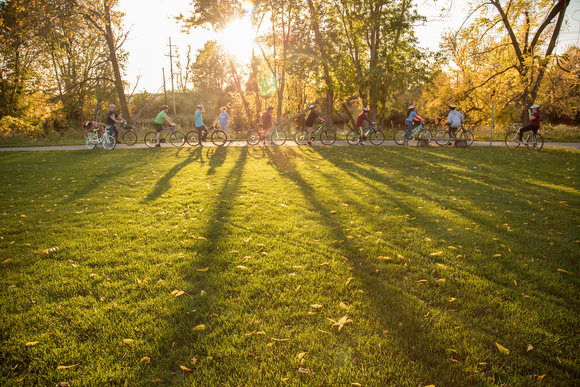 Applying for and receiving the Changemakers grant from the Kalamazoo Community Foundation, Alexander founded Open Roads as a mentorship program founded on bicycle building and repair workshops for kids at or below the poverty line. Distinguishing himself from other bicycle programs around the country, Alexander sought to pair social and emotional skills with mechanical skills, equipping his kids both physically and mentally for school and life. Kids gather for a group ride. Starting with just four kids and two adults meeting in a classroom at Kalamazoo College, Open Roads was a small organization with big ambition. 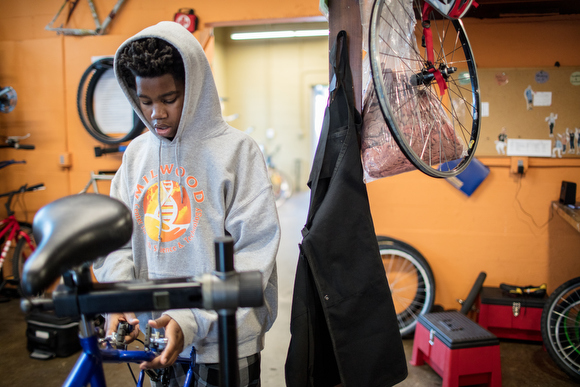 Though they have a variety of programs, they are most well known for Earn-a-Bike, in which students ages eight to 18 attend a bicycle building workshop once per week for six weeks. Each week, the kids learn mechanical skills such as replacing brake pads, and accompanying emotional skills such as putting on the "emotional brakes" and practicing self control. Many of the kids that attend the program are residents of the Kalamazoo County Juvenile Home. One such participant was David Taylor, an 18-year old student of Phoenix High School. "In that time I felt as though this program wouldn't help me at all," says Taylor, who was initially resistant. "I went through the program and found new ways to vent and more tools I could use in my everyday life." After completing the program, Taylor jumped on his newly completed bike and rode the trail to inquire about further involvement with Open Roads. "I joined the youth advisory board and met a lot of great people who helped me successfully get off probation and set goals to make myself successful," he says. "I was really excited because for the first time no one had judged me for my past or viewed me as a criminal. Immediately after I joined the youth board I applied for the apprenticeship which was a paid position to help youth build job training skills," says Taylor. Later being hired as the shop's mechanic, he now assists other kids in navigating the program and acquiring their own personal growth. Mike Poliak works on his bike in a workshop used for classes on repair.With dedicated and passionate youth like Taylor involved in the program, Open Roads quickly grew, and after seven years serving as a mobile workshop that brought all of their equipment and materials to the students, Alexander and company sought a physical location that would allow them to expand and serve their kids more consistently. Erin Denay, executive director who joined in 2014 as the program manager, noted that the nomadic quality of the nonprofit had previously limited their potential. "It was definitely lower capacity. We couldn't commit to doing as many programs," says Denay. Working with the Kalamazoo County Land Bank, Open Roads was notified of a new property called the Riverview Launch that sat directly on the Kalamazoo River Valley Trail. Though the building wasn't in great condition when they first viewed it, Alexander saw its potential in serving kids from a concrete location. After moving in in June 2015, Open Roads was able to settle in and quickly double the amount of programs they offered local kids. "It's been an amazing partnership [with Kalamazoo Land Bank]," says Denay. Serving 46 students in 2015, Denay and Alexander have increased the number of kids served to 92 after just one year. Also part of Open Roads' increased success was their location's proximity to the Kalamazoo River Valley Trail. Now children without access to traditional transportation can walk, run or bike to their weekly program. "Having the trail there is an important part of that [growth]" says Denay. Since relocating to the trail-adjacent property, the nonprofit has also been able to afford riding insurance for community bike rides. Now Denay and her students frequently take to the trail together in themed events like a recent Halloween ride. 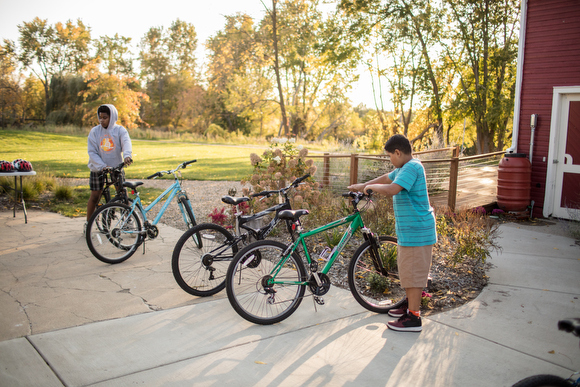 "Getting kids on their bikes is the next move for us," says Denay, who loves having an accessible path for the kids to test out their new wheels. Starting out with just a pile of bikes, Alexander has transformed his collection into a nonprofit that builds community, along with mechanical and social skills. Having recently celebrated one year at their trailside location, Open Roads is touching lives in Kalamazoo, and giving kids the tools to make their own successful pathways. "Open roads is viewed in my eyes as a family and I don't know where my life would have gone if I didn't meet these amazing people," says Taylor.